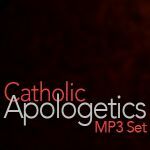 What would happen were the Pope a heretic? That the Pope, while he is not the lord of the world, nevertheless has indirect temporal jurisdiction in civil affairs when it is for the sake of the faith. In the second volume we see again Bellarmine’s splendid argumentation, based first of all in Holy Scripture, strengthened by the consensus of the Church Fathers and buttressed by arguments from later Theologians and reason. 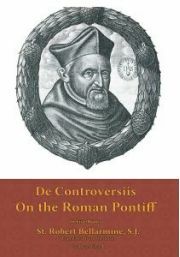 In book 3, Bellarmine shows the many contradictions and faulty reasoning used by the first Protestants in arguing that the Pope is Antichrist while also giving exposition to the authentic understanding of the passages of Scripture that speak of Antichrist. After covering presenting the testimony of Scripture and the Fathers on the signs that must precede Antichrist, Bellarmine shows how none of this agrees with the Roman Pontiff. He also refutes the fable of “Pope Joan”. In book 4, Bellarmine argues why the Pope is infallible when he defines on faith and morals and proceeds to defend Popes whom Protestants and others argued had erred while defining faith. He continues to a discussion of law, and why it is not contrary to the Gospel for the Pope (or a Bishop over his diocese), to make laws that bind the faithful, refuting the teaching of John Calvin. 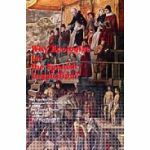 In book 5, Bellarmine takes up the question of the Popes power in civil affairs. Protestants had argued that the Pope tyrannously usurped the rights of sovereigns and that they meant to rule the world directly in civil affairs, while some canonists overly attached to a more medieval view were of a similar persuasion. He then proceeds to demonstrate that the Pope’s temporal is indirect, that he can intervene for the sake of the faith when excommunicating sovereigns. The protestants argued that a Bishop could not also be a temporal prince. This point is interesting in light of the fact that many, perhaps even most Catholics today hold to a position similar to the Protestant view Bellarmine refutes in this book.